The RiLL Ruby 1000 is the jewel in the crown of single colour diode lasers due to its bright wavelength of highly visible 635nm red laser light. 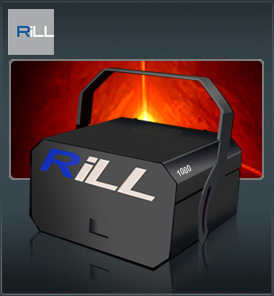 The Rill Ruby 1000 Utilizes at its core a 1000mw power house of high powered red laser light, meaning the RiLL Ruby 1000 blows the competition away with its revolutionary design and truly vivid red laser beams. The Rill Ruby 1000 is utter perfection and an amazing feat of engineering. It is currently the brightest single colour 635nm red laser diode available in the world today. The RiLL Ruby 1000 For those that know what they want, and know the best is only good enough.